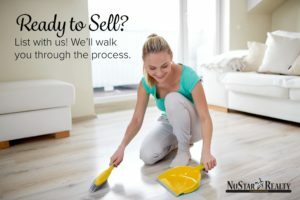 NuStar Realty offers a dynamic group of qualified professionals working as a team to guide you through to a successful closing. Our network is highly organized and efficient, utilizing modern technology to make sure you get exactly what you came for. These include such professionals as: lenders, title reps, escrow officers, transaction coordinators, home inspectors, contractors and handymen, among others. At NuStar Realty, we do more than answer your questions and open doors with a special key. We’re there every step of the way; guiding you through the sale of your home and solving common hiccups that present themselves in every real estate transaction. We help you negotiate your sale for the best price possible – armed with experience and understanding of customary contingencies, costs and terms. The Internet offers lots of great information, but the most important step you can take when selling your home is hiring a local professional real estate agent. Contact us today and let us know how we can help you take the next step to get your home sold. Buyers notice everything – good and bad. From the moment they walk in the front door, they are trying to determine if this is the right home for them and their family. If you have your home listed for sale, paying attention to what the buyers notice can mean the difference between an offer and a missed opportunity. Here are the top 7 things buyers notice as soon as they walk in your home.